Sportsbet.io is a bookmaker on a mission to deliver an extensive selection of sports betting markets and competitive odds, while at the same time introducing a feature-packed online casino, a live casino, multiple trusted and reliable payment methods, friendly and professional customer service. At this stage in their development, Sportsbet.io have opted not to release a dedicated Android mobile app but instead, meet the ever-increasing demands from mobile players craving access with a fully functional, high-quality mobile web browser based site. The mobile site has been designed to meet the needs of mobile users in the same high-quality design that it’s desktop counterpart provides. An equalled experience greets members and allows for easy navigation with innovative features and quick access to promotions, banking, customer support and betting markets. The result is one that is more beneficial leaving little need for a dedicated app not being available. As with those using Android devices, those with iOS will find that Sportsbet.io has chosen not to develop a dedicated iOS mobile download app, and as such, those using iOS devices will enjoy the same unparalleled access to a fully functional mobile version web browser equivalent of Sportsbet.io’s desktop site. The identical level of quality in design, execution to payment options, customer support, innovative features, sports, live dealer and online casino games are offered, all free of downloading and installing via a mobile app. Simply open a mobile web browser of choice, visit sportsbet.io and enter your pre-existing details, or if new to Sportsbet.io, create a new account by clicking on the “register” button. The Sportsbet.io mobile version has been designed to afford its users the same level of quality and reliability that is equal to that of a dedicated mobile app. That mindfulness in its design is met with an identical colour scheme ensuring members are met with a feeling of familiarity and comfort. Those accessing the mobile version will find the same innovative design elements relating to its layout, functionality and navigational qualities about sports betting, its online casino, live casino, the summoning of live support agents and its cashier. While great lengths have been undertaken to ensure the mobile version of Sportsbet.io derives an equivalent experience, the mobile device capabilities and internet speed will play a factor in the quality of experience received. However, this is hardly a factor of concern as the graphical quality, promotional and news alerts are exceptional and make placing a bet an effortless task. The Sportsbet.io mobile version of its website is one that features a modern interface built for the sophisticated user who is not intent on the use of a mobile app for their entertainment activities via their mobile device. One of the more engaging factors to the mobile version is the ability to access it anytime without the worry of using valuable storage space that so often comes when ladened with multiple downloaded apps. 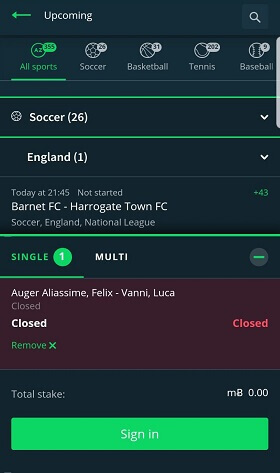 It only requires you to open your mobile browser, visit the Sportsbet.io site and enter your account details to access all its great betting features. As an added benefit, the mobile site affords the luxury of drop-down and slider menus and is perfectly sized to fit most mobile devices. While it offers equal features as its sister desktop site, some features deserve closer attention. The Sportbet.io cash out feature is a valuable option for bankroll conscious punters looking to minimise losses as it provides a greater level of control over active bets. This feature is offered on a various selection of sports events at Sportsbet.io, and when available, will afford you the option of an early cash-out. This essentially is the act of walking away from your active bet when in a position that you think will end in a non-favourable result. It will see the forfeiting of 50% of the staked bet in return for 50% of the staked bet credited back to member accounts. In-play betting is highly sought after and a big part of the experience generated by sports punters at Sportsbet.io. In-play allows for the pacing of a bet on an active match or game on a wide variety of different sports daily and includes updated live odds as well as in-depth statistical information as well as a wide variety of different betting options. The In-Play feature is located at the top of the Sportsbet.io site to give you instant access to current matches as well as upcoming matches. Live streaming via your mobile is a favourable option for many punters while their teams are in action. It permits the opportunity to place bets, when co-originated with the in-play betting feature, in real-time. Sportsbet.io has made this an available option on a variety of sports and includes updated on current live streamed matches, and to make life less complicated, a list of upcoming events for the following day and the near future. All odds are updated in real-time and include an extensive selection of bets that can be placed during the match in progress to allow for a superior betting experience. One of the biggest aspects to Sportsbet.io’s attractiveness are its sports betting options. While that may be what attracts some, its other betting options are equally attractive providing a stable gaming environment that appeals to a broad range of punters. Those options encompass not only a live casino but a thoroughly designed online casino that provides access to an extensive selection of casino games that marvels that of the best in online entertainment. The mobile sportsbook is well-appointed with a broad selection of sports including Handball, Golf, Floorball, Ice Hockey, Darts, Cricket, Soccer, Tennis, American Football, Baseball and many others. Additionally, those punters interested in unique sports will find Bandy, Table Tennis and even StarCraft. Each of the sports is joined by an extensive list of betting markets such as Asian Handicap, Correct Score, Total Corners, Draw No Bet and many others. To allow for the locating particular sports events of interest, Sportbet.io has a convenient search bar function that will allow for the efficient locating of sporting events in seconds thereby eliminating the need to search each individual sport. The mobile casino is extensive, and for those with a desire to access casino games, the categories and list of games is impressive. This not only includes traditional offerings such as slot games but also includes a variety of others such as jackpot slots, table games, scratch cards, lottery and virtual sports. As with the sportsbook, a convenient search function allows for quick locating of games of interest and the ability to search based on popularity, alphabetically or by provider. The list of providers is derived from the best in casino game development and includes the likes of NetEnt, Yggdrasil Gaming, Red Tiger Gaming, Quickspin, Play’n GO and Pragmatic Play to name a few. Another valuable betting option at Sportsbet.io is its live dealer casino. It affords the luxury of playing live dealer games, all of which are hosted by engaging, attractive dealer’s intent on providing a professional environment in real time. Powered by Evolution Gaming, Ezugi and Lotus Gaming, it features all the most popular live dealer games such as Baccarat, Blackjack and Roulette. However, it also delves into the less know such as Dragon Tiger, Super Spade and Dream Catcher. Those accessing via their mobile devices will enjoy the same benefits of play as those via the desktop site such as dealer interaction. This generates an equal quality live dealer experience and one that most sportsbooks are unable to match. While it could be said there are some disadvantageous to the Sortsbet.io mobile site when compared to its online counterpart. The truth of the matter is there are few, and that is due to the overall design of its mobile site being equal to that of its online one. Therefore the experience derived from either is identical with the only notable difference being the viewing sizes experienced when accessing via a mobile device. However, beyond that, there are none to draw attention to. Ultimately, the decision not to offer a dedicated mobile app, in this case, has proven to be an advantage. This is due to the mobile site featuring the same selection of sports as it does betting options, and the same principles are applied to its live dealer, online casino, support, banking and account options. A powerful feature towards mobile compatibility at Sportsbet.io is its professionally designed mobile site that instantly, for the most part, grants compatibility for the majority of today’s mobile devices. That in itself elevates the need to worry for most mobile punters leaving the only concern being if the accessing device has the latest operating system. In the case of Android and iOS devices, most will operate at a high level of functionality irrespective of whether the newest version is installed. However, for those interested, most will provide automatic updates when newly released, or updated operating systems are released. As a multi-platform sportsbook and casino, Sportsbet.io firmly believes in promotional equality to all its member, regardless of their accessing preferences and to that end, does not feature mobile-specific promotions. All members are therefore able to fully participate in any and all bonuses or promotions, whether a welcome bonus or existing member featured promotion. Sportsbet.io offers an extensive range of payment methods to facilitate the transacting of deposits and withdrawals. Members can select from credit cards, e-wallets and cryptocurrency options to process deposits into their accounts or to receive payment when withdrawal requests are made. Below, we have included a table that outlines the available transacting methods, the minimum deposit and withdrawal amount, and the time before the receipt of withdrawals will be received. Is the Sportsbet.io mobile browser site secure and safe? Absolutely. Sportsbet, like most mobile sportsbooks operating using the latest in sophisticated SSL encryption software. It works continuously to provide a safe and secure environment that protects all personal account information as well as any financial transactions carried out within its banking facilities. Does Sportsbet.io offer in-play betting for mobile users? Yes. There is a decent selection of in-play betting options offered to mobile members. It includes constant updating of odds and a variety of statistical information to assist punters in the processing of betting decisions. Am I able to take advantage of the cash out option via the mobile version? Absolutely. As with its desktop version, Sportsbet.io has chosen to replicate all its offered features to its mobile site. Mobile punters can execute partial cash-outs on existing bets. Am I able to access virtual sports games at Sportsbet? Yes. Sportsbet.io offers virtual sports. The mobile version features a selection of virtual sports betting opportunities. I am considering registering a new player account at Sportsbet.io. Is there any welcome bonus promotions I could qualify for? Yes, absolutely. As a forward-thinking promotionally focus sportsbook and casino, Sportsbet.io will award equal to 3x your initial staked bet on single, multi or pre-line events up to a maximum of €30. Once registered and acceptance of this offer, punters, will have access to a variety of different promotions as noted on the promotions page at Sportsbet.io. Does Sportsbet.io offer a F.A.Q. page should I need help without wanting to contact support? Yes, an F.A.Q. section is part of its extensive support services offered to punters. It covers segments such as payment options, responsible gambling, general terms, conditions and betting rules as well as a selection of questions most frequently asked. If I claim the welcome bonus for the sportsbook, am I required to enter any special promo code? No, you only need to transact your first deposit and place your first bet up to €10. Once settled, Sportsbet.io will automatically credit your account with a free wager equal to €30. Are all mobile banking transactions protected against outside interference by third parties? Yes. The same software in use via its desktop cashier is employed at the mobile site to ensure compliance with financial regulations as outlined under its licensing agreement. This is carried out using certified SSL encryption software. What methods of contact are available to me when wishing to speak to customer support? Currently, Sportsbet.io offers support via an email entry form and live chat. Both methods of contact are available via the mobile site and open 24 hours a day. Sportsbet.io, an upcoming sportsbook and casino, is owned by mBet Solutions NV and maintains its base of operations at Heelsumstraat 51 E-Commerce Park Country Curaçao. A licensed and regulated betting establishment, it operates under a license issued by the Government of Curaçao (1668/JAZ) that grants it permission to offer sports betting as well as casino games and a live casino. Punters interested in contacting the company may so via emailing its customer service department at cs@sportsbet.io or by accessing its live chat support services. Our review of the Sportsbook.io mobile site led us to many discoveries that left us pleased by the results. While at first we were disappointed by the lack of dedicated mobile apps that quickly evaporated after seeing the value in its mobile site in so far as to its same design, both in appearance and betting features. Coupling that together with a large selection of baking methods, many of which are geared towards those who prefer to use cryptocurrencies, solid support services and a professionally designed interface that offers exception navigational qualities, we give Sportsbet.io Mobile an overall rating of 8 out of 10.